Last week, I discovered the biggest head of cauliflower I had ever seen. It was heavy, the florets culminated in little conical peaks, and the surface was almost furry in appearance. 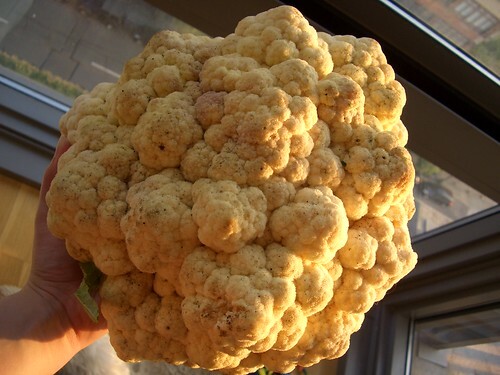 This cauliflower was completely unlike any I had ever purchased in a supermarket. It looked real and it was beautiful. Also in season right now: eggplant. If you head to the farmers’ market, you’ll soon discover that this vegetable comes in more shapes and sizes than the dark and familiar oblong two-hander. Some are long and skinny, others squat and round. Not only that, but you’ll also see stark white, creamy lavender, and dramatically streaked varieties. They’re all lovely, really. A couple bundles of fresh herbs, blueberries so plump they looked as though they might burst, and a few brightly colored heirloom tomatoes found their way into my hands as well. I’m truly loving the markets this year. And I also must say that Chris and I are loving the new flavors that we’ve been experiencing in attempting to think about food in different ways. We both love cheese, and it’s easy to make something, anything really, taste amazing if you stuff it or cover it with enough cheese. While this isn’t necessarily a bad thing, I could see myself very quickly settling into quite the cheese rut here every Monday if I weren’t pushing myself to keep things dairy-free as well. And in such a rut, I’d have never thought to stuff eggplant with cauliflower. 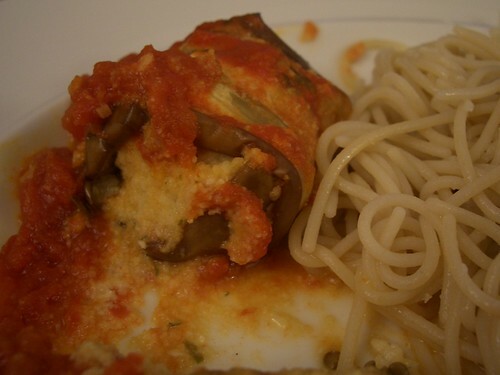 These eggplant rollatini are sweet with tomato and basil, slightly nutty and pleasantly bitter with cauliflower and tahini. They’re an interesting departure from the milky ricotta we all expect, and another way to use up those massive clusters of white that have been popping up lately. Preheat the broiler on low. Move the top rack so that it is on the level below the topmost position. Heat 1 tablespoon of olive oil in a medium saucepan over medium low heat. Add the garlic and cook until fragrant, about 1 minute. Add the whole tomatoes along with their juices, crushing each tomato by hand and discarding the hard stem ends. Bring sauce to a boil; reduce heat and allow to simmer while assembling the rollatini. Slice the eggplants 1/4″ thick. Each eggplant will yield 4-5 slices that will be long enough to “roll up.” Spread the eggplant slices in a single layer on a baking sheet; work in batches if necessary. Brush with olive oil and sprinkle with salt. Place the eggplant on the top rack under the broiler and cook for 5 minutes. Flip the eggplant, brush again with olive oil and season with salt. Allow to broil for an additional 5 minutes, or until the eggplant is tender. While the eggplant is cooking, place the cauliflower into a food processor. Pulse until the florets have become coarse and granular. Add the tahini and process until well combined. 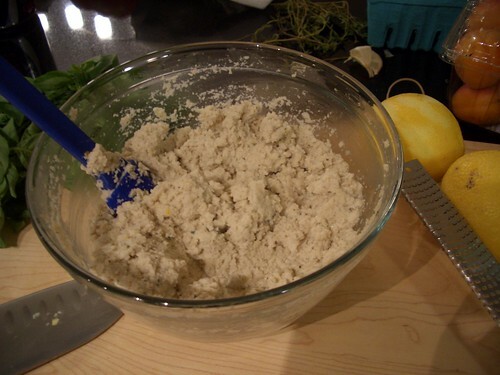 Remove the mixture to a medium sized bowl. Season with the thyme and lemon zest; stir to combine. Add salt and pepper to taste. Once the eggplant is tender and has been removed, reposition the top rack and set the oven to 375 degrees. Remove the slices of eggplant from the baking sheet to a cutting board or plate and allow to cool enough to handle. Spoon one tablespoon of the cauliflower mixture into the center of each slice of eggplant. Roll the eggplant around the filling and place, seam side down, in a baking dish. Repeat until all the eggplant has been filled. Add the basil to the tomato sauce. Cook for a minute longer and then pour the sauce over the rollatini. Place the baking dish in the oven and bake for 30-35 minutes. If desired, serve alongside rice spaghetti drizzled with olive oil and sprinkled lightly with salt. This recipe is still just me playing around, but I'm sure I'll start consulting some "real" recipes soon (nut cheese sounds delicious!). The cheese in this recipe did have a lot of flavor–slightly bitter, but in a good way. Please let me know if you do make it and have any comments/suggestions! Britt, the thing is that I always think that eggplants have the texture of a sponge. I wonder if slicing them so thin makes them taste better?? They're really only spongey when they're raw. When cooked, they get sweet and soft and melty.That's it–you're coming over for dinner and I'm making you eggplant. 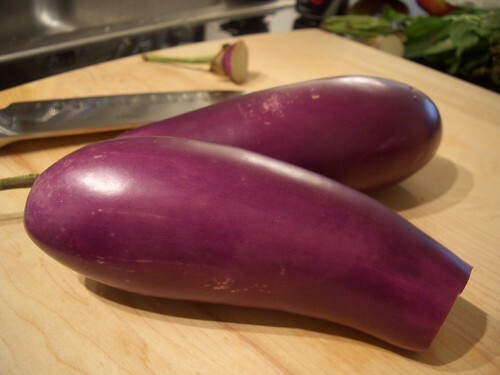 Wait, wait a minute… I said I hated eggplant too – I'm coming over with Jen.